The Greene-Dreher Historical Society recently hosted Don Borkey, a national representative of the Patriotic Order Sons of America, in a flag presentation ceremony at the Society’s annual Open House and Ice Cream Social. Our Peggy Bancroft Hall and Museum was built in 1904 by the Patriotic Order Sons of America of South Sterling, Washington Camp 422, to serve as its meeting hall. 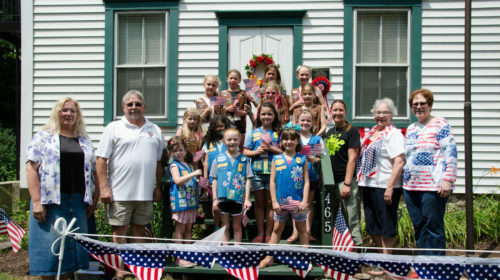 Local Daisies, Troop 50749, raised the flags of both the United States and Pennsylvania to a large and appreciative crowd. Throughout the event, visitors enjoyed tours of the museum and outdoor exhibits and sampled home-baked pies and ice cream made on-site by a 1910 hit-and-miss engine. 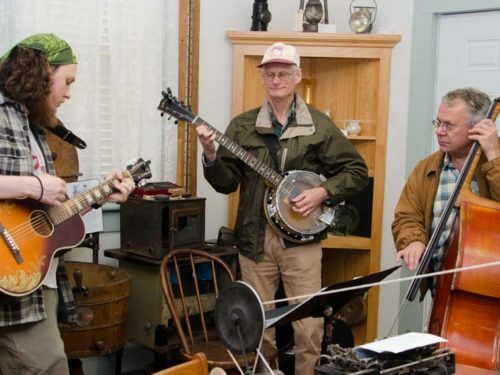 The Greene-Dreher Historical Society will hold another open house, “Jammin’ Jelly”, on Saturday, October 13 featuring Bluegrass jam sessions, book-signings by local authors, and a homemade jam and jelly sale.